I was wondering how I could capture equity and justice in my daily life. Reading through the website I noticed that 83.8% of single parents make up the population in the western region of Melbourne. Mmmm I'm one of those 83.8 per cent, so I thought about my life and came up with the juggling act. Although talking with other women who are married they have their own form of the juggling act too. The Lego head represents my child (Ben) and his every smiling happy face. The basketball represents our struggle to fit in exercise to our busy life. The toys – the fallen hulk shows the loss of man in our life and the nerf gun says we can and will protect ourselves. 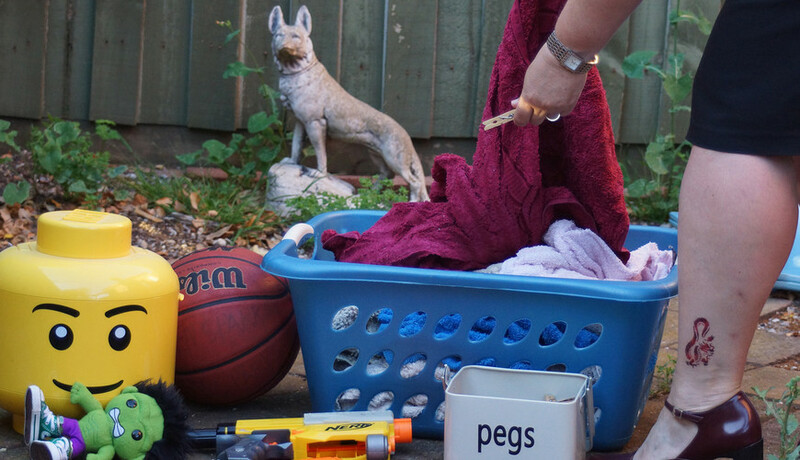 The washing – because, there is always washing. My legs with body art - a working mother dressed in heels and skirt putting out the washing. Struggling with roles of responsibility (of mother, daughter, employee, team mate, friend) and time for herself. Weeds – there's never enough time to do the things you want to do.